Ok…no more dragging my feet. This race report isn’t going to write itself. People keep asking me “how did it go?” Honestly…it sucked. It didn’t go how I wanted it to go. The marathon definitely ranks in the top ten best worst days of my life. Do you know what “worst case scenario” is when it comes to training 16 weeks for a marathon? Waking up with a stomach bug / food poisoning 12am the morning of the race. Worst case scenario. I cried. I moaned. I lost 3lbs from 12am to 6am. Starting a marathon dehydrated was the last thing I thought I would deal with. I’ll spare you the gross bathroom details, but I will say I managed not to throw up. The minute I start puking, my body shuts down and the dehydration gets BAD. I’ve lost count of the number of times I’ve ended up with an IV in my arm from that kind of dehydration. I considered my options. I googled upcoming marathons in 2015. Tulsa? Dallas? I even contemplated endless loops of Derby High Park with the crazy ultrarunners this coming weekend. Ultimately, I pulled up my big girl pants, dosed myself with enough dramamine and zofran to put Tiny Boy to sleep for a week, laced up my shoes and headed to the starting line. Was it my smartest move? Nope. Was it my gutsiest? Yep. Mr. Neon told me he wouldn’t leave me. He would do what we needed to do to get me to the finish line. We started off fairly well, considering how I felt. Whatever illness I was fighting managed to ebb just enough that I was able to keep a sub-5:00-marathon goal pace for the first half of the race. Around mile 5, I started to experienced some low abdominal cramping that bordered on stabbing pain. We’d walk a little here and there for me to stretch out my sides. The low pain went away around mile 14, only to be replaced by intense lower back pain. I would have to stop every 5-10 minutes to bend over and then get down in a squat to stretch out my back. I had a cyclist aid person follow me around for a couple of miles to make sure I was ok. I was not ok, but I wasn’t going to stop moving. By mile 18, my run was done. We power walked. We played run to that cone, walk to that cone. The miles ticked by so slowly. We met some interesting people at the back of the pack. A guy from South Carolina who is trying to run a marathon in every state. He doesn’t even own a Garmin. Prairie Fire was number 27 for him. We met some Galloway disciples. Their beeps every 90 and 30 seconds made me crazy, but they were having fun. We walked for a while with a fellow sufferer. 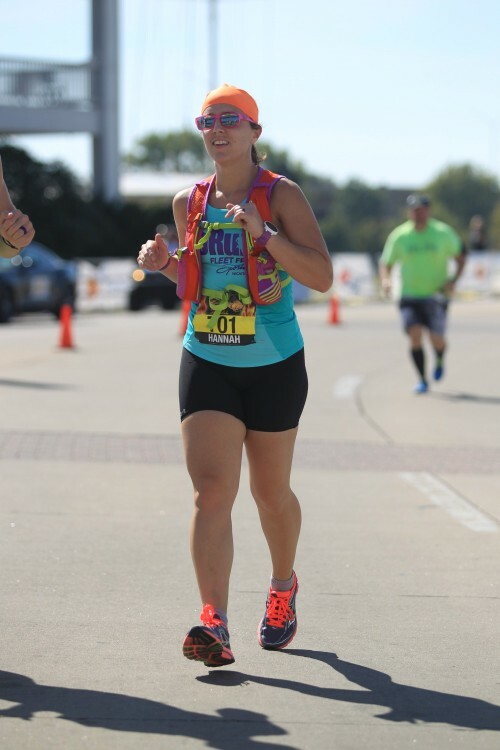 She was on pace for a 4:30 marathon when her hips started hurting. She walked the last half of the race at a seriously impressive steady walk pace. Every time I had to stop to catch my breath or stretch or let a wave of nausea past, Mr. Neon would yell, “Up. One foot in front of the other.” The last mile took us 18+ minutes. Mr. Neon yelled at me to look up…”The finish line is right there! The Hyatt is right there. Don’t stop!” If he hadn’t stayed beside me, I would have stopped. The bridge was in sight. I knew we were going to come in under 6 hours. I figured everyone else had gone home. But no…we had friends waiting. Blanca, Will, Monica, and Will and Monica’s two boys were there. They walked us to the bridge and then they got me running again. It was the slowest little jog I have ever done. But I ran up and over that bridge and there were my boys. Runner Boy was jumping up and down. I heard Tiny Boy scream, “Go Mommy! Go Daddy!” And I crossed that finish line at 5:55. Ouch. I immediately doubled over. A volunteer girl put my medal around my neck (Oh…that big glorious medal. It’s the prettiest thing I’ve ever seen! ), unscrewed a water bottle, and laughed when I barked at her that I didn’t want purple gatorade. I shuffle walked to the finisher tshirt tables and yelled at the lady that I wanted a small. My mom laughed and ran ahead to get it for me. (By the way, my badass mom ran a 2:44 half!) All I wanted to do was sit down, which I did on a curb in the parking lot. I’m still a jumble of emotions when I think about those nearly 6 hours between the start and the finish of my first marathon. The whole thing was a blur of pain and frustration. But these are the conclusions I made in dwelling on all of it. I love my family and my friends. I can’t believe they stayed. I’m stronger than I thought. Stubborn. Tough. If I can run a marathon in those conditions, what can I do in ideal conditions? I don’t hate running. No matter how many times I said it. I will run another marathon, even though I told my dad while sitting on that curb that I wouldn’t. Good thing, he didn’t make me write it down and sign it. Marathon training broke me. I forgot to love running. I made it a chore, another thing on the to-do list. When running stops being fun, it’s time to change gears. XTing is making a comeback. My bicycle and I are going to make friends again. The dust is getting blown off the PiYo DVDs. A smile? A grimace? I was so glad to see that finish line. Until next time, Prairie Fire. Maybe you’ll be kinder to me in 2016. Please?